Avril performing on stage in Toronto, ON October 24 for The Black Star Tour. Avril appeared on MuchMusic's New.Music.Live earlier today for a 1 hour sit down. For now, watch the interview on MuchMusic's site. ITS HERE! The studio version of "The Best Years of Our Lives" from Evan Taubenfeld ft Avril Lavigne is now on iTunes! Check out your countries iTunes store and buy! If it isn't there yet, keep checking because it will be released worldwide on October 25. It's a lot different from the original version, has an electronic feel. Avril's voice sounds amazing! Listen here but please support Evan and buy it on iTunes! Avril was in her hometown of Napanee yesterday to receive an award from the mayor: "In recognition of success by your hometown". She singed autographs for some lucky fans, and enjoyed pizza at her favorite high school lunch time spot, La Pizzeria! 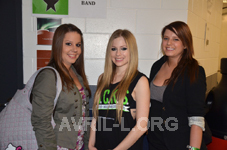 Here are my meet and greet pictures from Avril's October 14, 2011 show in Winnipeg. Read my review a few posts below to see Avril's reaction to the fanbook that I gave her! 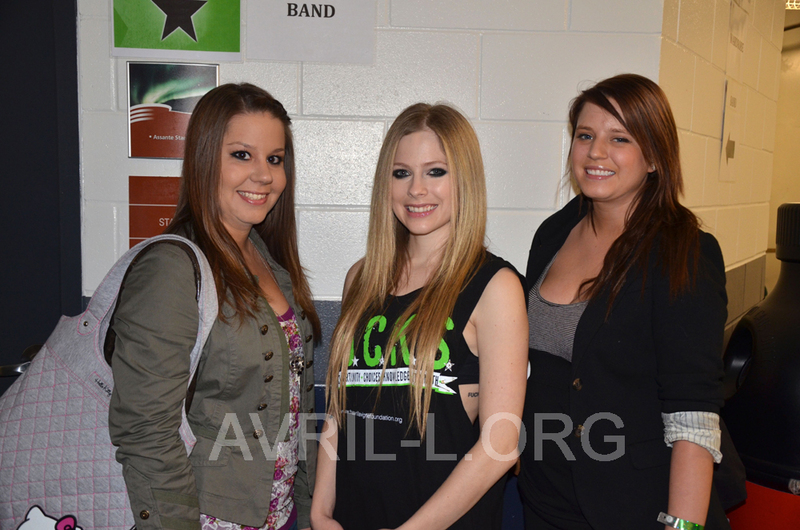 The first picture is me, Avril and my cousin Ashley, and the second is me and Avril with the fanbook. She was so happy! Avril performing on stage in Moncton, NB October 19 for The Black Star Tour. Avril performing on stage in Ottawa, ON October 17 for The Black Star Tour. Evan Taubenfeld has confirmed via his Twitter that a studio recording of "The Best Years of Our Lives" featuring Avril is done and should be released soon! Can't wait! Started off with my cousin and I getting to the venue for the 5:30pm VIP check in time. There was already a lot of people so we were at the back of the line, but that didn’t bother me as I knew there was a separate VIP section from the regular GA, and there is no way you can have a bad viewing spot. After we did the merch shopping (I just bought a tour book), we were lead down to the floor level, and like I thought, ended up being 3rd row dead center, but with a perfect view of the stage (lucky for me there were little kids in front so there were no obstructions). Then we waited, and waited. When the show started at 7:30 and Evan came out, he was his usual talkative, bubbly self, telling jokes to the audience, and playing around. I really enjoyed how his songs sounded acoustically. You can really feel the lyrics and it was great for the audience to hear the raw lyrics since no one really knew who he was (I, of course, sang along to every word, I think people were wondering how I knew them!). I was really surprised when he sang Avril’s Innocence. He had the whole crowd in a massive sing-along. Great 20 min set from him, and I was looking forward to seeing what he had in store with Avril for the encore. He announced that he would be signing CDs and taking pictures after his set so we decided to go and try to get one, but so did the rest of the arena with thousands of screaming girls running around the concourse � it wasn’t worth standing in a huge mosh pit. The New Cities were just hitting the stage so we decided to go and check them out instead. They had great energy, but their music sounds like everything else on the radio these days. Good, but not amazing. Then I was getting nervous because I knew I was going to meet Avril at 8:45, after the New Cities set. We went to where we were supposed to meet her tour manager, and luckily he was just coming around the corner, about to call me. He whisked us backstage, then I saw Amie coming out of one of the dressing rooms. I said Hi of course and she said Hi back. We were told to wait in catering until they were ready. It smelt sooooo good in there, but I didn’t want to just help myself haha. While we were sitting there, Gabriel, Avril's makeup artist, walked in. I introduced myself and we had a quick exchange. He said it was nice to put a face to the back and forth tweets and told us to have fun meeting Avril! So again, we waited for about 10 mins then went out into the hallway. I could hear her talking to the VP of the arena a little and taking a picture. Then it was our turn! I was very pleasantly surprised how giggly and happy she was with us. I think that it is completely different when she isn’t doing full meet and greets, in which she has to meet hundreds of fans a night and it makes it difficult to have a conversation. All in all, we had just over 5 mins with her, but I will never forget it. When I get the pictures from the M&G, I will be sure to post! The show started about 10 mins after we got back to the VIP section. When everyone says that her voice has matured, you can absolutely tell. The stand out songs were Alice, the very end of I Always Get What I Want where she does this really high note that I’ve never heard her do before, and of course, Avril and Evan’s duet of his solo song The Best Years of Our Lives! Their on stage dynamic is amazing to see. Avril kept looking over at him and smiling. This show is definitely the most happy I have ever seen her. Smiling constantly, engaging the crowd, doing cartwheels. She also interacted quite a bit with Jim. There were some feedback issues with the guitars during My Happy Ending in which she kept looking at him and giving him a “What the hell?” face. My only comment would be to move around the slower songs. Right now she does Alice, When You’re Gone and Wish You Were here together, and it seemed to drag a little bit. I heard people around me commenting, “another slow song”? I love her ballads because it truly showcases her voice, but I also love to see the crowd rocking out and having fun too. It’s too bad that her TV performances aren’t as amazing as the shows. There were 6,800 people at the show, and so far the biggest on the Canadian tour! (which really surprised me as we are not the biggest city). Overall a great Avril show, with some great songs, great energy! A night to remember!